On the occasion of Ian Davenport: Colourscapes, Waddington Custot is delighted to host an artist’s talk between Ian Davenport and Jonathan Watkins, Director of Ikon Gallery. 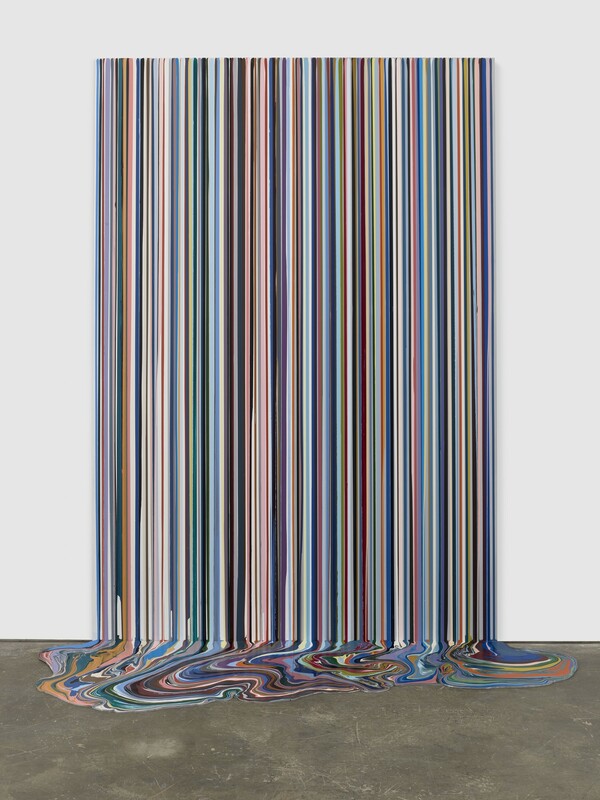 Ian Davenport will discuss his most recent work on show at Waddington Custot, and his museum survey currently at Dallas Contemporary in Texas. Davenport remains a pioneering innovator of the painterly method. In developing the process of his recent Diagonal series, Davenport explored how to manipulate the flow of liquid acrylic to make compositions of greater complexity and variety. Looking to expand his artistic dialogue, he invented a method of pouring a sheet of different colours together in one gesture; as he controlled the paint’s flow, he could experiment with the expansion and contraction of line, effectively ‘drawing’ with the paint. In contrast to the controlled, thick streams of paint in the Diagonal series, Davenport’s Splat paintings resemble explosive fireworks. The artist uses a syringe to jet paint onto the paper, the fallout from the paint’s impact as it hits the paper leaving a spray of colour. Davenport received early recognition participating in Freeze, a student-curated exhibition at the Surrey Docks, London, in 1988. Only two years after graduating from Goldsmiths’ College of Art in 1988, Davenport had his first solo exhibition at Waddington Galleries in 1990. He was nominated for the Turner Prize in 1991, and in 1999, was awarded the prestigious John Moores Painting Prize. Davenport has been the subject of numerous exhibitions worldwide, with solo exhibitions at Ikon Gallery, Birmingham, Tate Liverpool and Dallas Contemporary, Texas. His work is held in important museum collections throughout the world, including Tate, London; Centre Pompidou, Paris; National Museum Wales, Cardiff; Von der Heydt Museum, Wuppertal; and Dallas Museum of Art, Texas. Jonathan Watkins has been the Director of Ikon Gallery, Birmingham, since 1999. He was previously a curator at Serpentine Gallery, London (1995–1997), and the Director of Chisenhale Gallery, London (1990–1995). He has written extensively on contemporary art, and is the author of the Phaidon monograph on Japanese artist On Kawara. He has curated several international exhibitions, including the Biennale of Sydney (1998); Quotidiana, Castello di Rivoli, Turin (1999); Facts of Life: Contemporary Japanese Art, Hayward Gallery, London (2001); Tate Triennial (2003); Shanghai Biennale (2006); Negotiations, Today Art Museum, Beijing (2010); and the Guangzhou Triennial (2012). He curated the Iraqi Pavilion for the Venice Biennale (2013), and Floating World at ArtBAB, Bahrain (2017). Watkins is curating Small Between the Stars, Large Against the Sky, to be exhibited at 2019 Quebec Biennial.